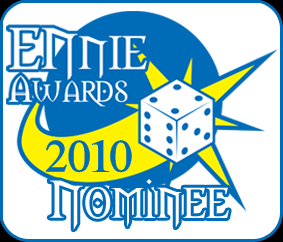 LotFP: RPG: LotFP Nominated for an ENnie! The Grinding Gear is nominated for Best Adventure. edit: Thanks to Laura Jalo and Ramsey Dow for shaping the presentation of the adventure! Death Frost Doom got an Honorable Mention for Best Cartography. Also of Old School interest is Labyrinth Lord getting an Honorable Mention for Best Game. All Games Considered is nominated for Best Podcast, and I was interviewed on there this past year so they're my favorite. They are also accepting nominations for Fan Award for Best Publisher here. If you enjoyed Death Frost Doom, No Dignity in Death: The Three Brides, People of Pembrooktonshire, or The Grinding Gear, considering nominating LotFP for this category. Lamentations of the Flame Princess is the company's full name, and the website address is http://www.lotfp.com/RPG/. Actually, AGC is one of my favorite podcasts. They're great! Nice work, Jim! Good luck on taking home the prize. Dude, that is totally cool! Congrats, and I am on the way to nominate because they are some of the best adventures to come along ina long while...! Congrats on the nominations. I'm a big fan of Old School games, and I enjoyed the opportunity to review your submissions. Best of luck in the public vote! Be sure to vote for me for 2011 ENnies Judge!